Margaret Meserve, assistant professor of history at the University of Notre Dame, is one of 15 scholars to win a 2006-07 Rome Prize fellowship from the American Academy in Rome. Designed for emerging scholars in the middle or early stages of their careers, the Rome Prize provides winners with a stipend, a study or studio, and room and board at the American Academy in Rome for six months to two years to pursue their research and scholarship. Rome Prize fellowships are awarded to scholars working in ancient studies, medieval studies, Renaissance and early modern studies and modern Italian studies. Fifteen fellowships also are awarded to emerging artists in the fields. 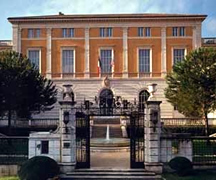 Established in 1894, the American Academy in Rome is a center that sustains independent artistic pursuits and humanistic studies. Fellowship winners come to the academy to refine and expand their professional, artistic or scholarly aptitudes, while drawing on the cultural and intellectual resources of Rome. Originally published by Susan Guibert at newsinfo.nd.edu on May 10, 2006. Originally published by Arts and Letters at al.nd.edu on May 09, 2006.